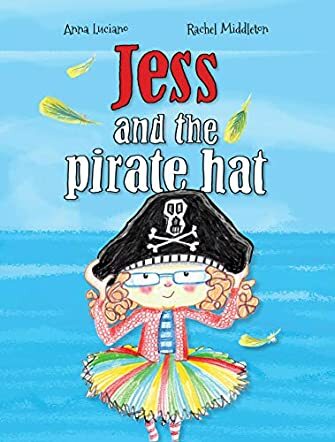 Jess and the Pirate Hat, written by Anna Luciano and illustrated by Rachel Middleton, is a children’s story about a young girl named Jess who finds herself bored. Jess sorts through all her typical toys and finds nothing that sparks her imagination, nothing she wants to play with. Then Jess finds a treasure she hasn’t played with in a long time; her pirate hat! As she places it on her head, her imagination takes off on an incredible adventure of fun and excitement, full of new people and animals; the kind of adventure she loves the most. I loved Jess and the Pirate Hat. This is a wonderful children’s story with beautifully crafted illustrations by Rachel Middleton. The pictures and words that tell Jess’s story work hand in hand in spinning the plot of an imaginative little girl caught up in an exciting pirate adventure. The characters are fun and entertaining as Jess encounters pirates, birds and mermaids as she sails along to find the treasure before the other pirates get to it. Jess and the Pirate Hat is a very well thought out story with playful concepts that will help a child discover a whole new world of fantasy and pretend that are essential to a child’s growth and development. I recommend this wonderful story that Luciano and Middleton have woven together because it will entice children for years to come as they learn to read on their own, guided by the pictures as much as the words that, together, will encourage them to want to read more. This is thoroughly enriching and enchanting children’s book, where Jess goes on an adventure with her pirate hat. The illustrations within the book really bring the characters and scenes to life, with so much detail and bright colours! I really enjoyed reading Jess and the Pirate Hat, and would recommend it to my younger family members.